and how it benefits humanity as well as "Warnings." "Just a handful of books in the last generation have been able to capture the importance of science and its benefit to mankind in an engaging manner: Isaac’s Storm, Rocket Boys, The Right Stuff, and the Joy of Chemistry. Add to this list, Warnings: The True Story of How Science Tamed the Weather." 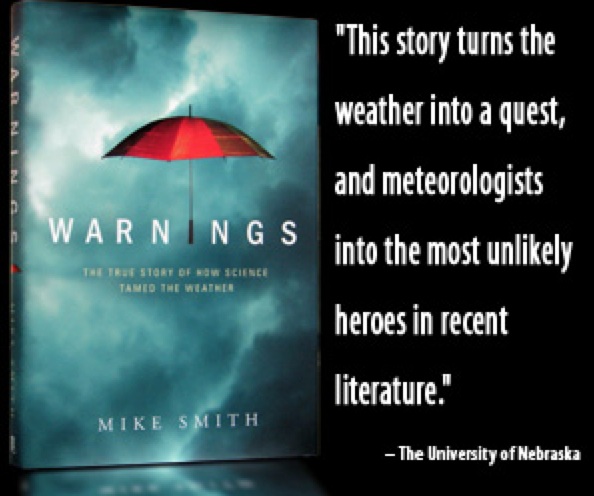 Warnings is the upbeat and uplifting story of how weather science keeps planes from crashing and saves lives in hurricanes and tornadoes. You can purchase from Amazon, here. If you prefer to shop with Barnes & Noble, go here. Or, ask for it at your local bookseller.